VIVA publishing technology helps national and particularly international companies in the food and beverage industry as well as their national and international representatives to optimize their marketing processes. With constantly rising costs and sinking margins, companies in the food and beverage industry worldwide must act faster and be more flexible. What should one then do, when you have to save on costs and time, present a professional front and at the same time work efficiently? VIVA provides you with flexible publishing technologies and solutions for manual, semi or fully automatic creation of marketing documents such as catalogs, packaging, labelling, price lists, menu plans, posters and business documents. Our publishing technology and products help companies in the food and beverage industry to optimize their communication, co-ordination and creation processes and reduce their marketing costs. Optimize processes – but how? Even though the significance of the Internet has increased, no companies in the food and beverage industry can do without the creation of catalogs, packaging, price lists, etc. Particularly the creation of catalogs and packaging with regard to the legal marking requirements (i.e. EU regulations) involves long lead times and high costs. To be sure of maintaining the Company’s CD (Corporate Design), the necessary documents for the company and also its business channels are generally produced by ad agencies or internal graphics departments. As well as the actual graphic production, extensive organizational processes are necessary for the creation of the documents. Communication and co-ordination between the internal and external product managers and the graphic designers with regard to content and appearance is costly and time intensive. To achieve a saving effect, both the internal and external work processes must be accelerated dramatically and investment reduced to a minimum. This is just where the VIVA technology comes in. With the help of VIVA publishing technology, it is no longer the graphic designer who produces the necessary documents. Instead, the employees in Sales/Marketing or even employees of national or international representatives produce the necessary marketing documents themselves. This happens right away and without any prior knowledge of graphics programs or technical printing requirements. The graphics designers just ensure that the employee has the appropriate templates at his disposal. Viva is one of the leading technology companies worldwide in optimizing marketing processes. Hardly any other manufacturer of standard software offers more options for optimizing marketing processes. Even competing products can be integrated into our workflow processes. 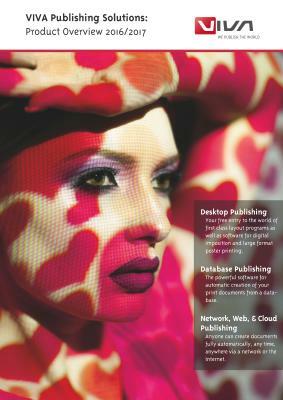 Click here for more information about general WORKFLOWS and PROCESSES with VIVA Publishing Solutions. Click here for more information about general PRODUCTION TYPES with VIVA Publishing Solutions. With Viva publishing technology you have the chance of saving a lot of time and money by decisively optimizing the communication, controlling and creation processes in the creation, editing and management of marketing documents. Corporations that are active worldwide achieve a particularly high degree of saving, as the Viva technology can handle all languages (incl. Chinese, Japanese and Korean as well as Arabic and Hebrew) in one document. We are experts in our field and know and understand your problems, requirements and wishes based on 20 years of experience. We speak your language! Benefit from our know-how and discover the many possibilities for optimizing your marketing processes. We would be happy to show you the advantages of our technology.